Press Statement: Uganda Government should protect HRDs during 2016 Elections! Kampala, October 16th, 2015: We, the National Coalition for Human Rights Defenders in Uganda (NCHRDU), hereby call upon the government to protect Human Rights Defenders (HRDs) in this election period. Human rights defenders are people who, individually or with others, take action to promote and protect human rights. We urge the government to support HRDs and their work, by ensuring their protection, security, safety and dignity. It is primarily the duty of states to protect and promote human rights of their citizens. HRDs play a key role in documenting and calling attention to situations where states do not fulfill this duty and human rights violations are committed. HRDs are often spokespersons for vulnerable and marginalized groups or for people who are not in a position to defend them. In many cases, HRDs represent grass-roots movements that are working to ensure justice and to secure the implementation of human rights standards in their country. Supporting their work is an investment in the rule of law, democracy and free and fair elections we all aspire for. We have noted with concern that human rights defenders in Uganda face a myriad of challenges including death threats, harassment, torture, beatings, arbitrary arrest, killings, detention, defamation as well as restrictions on their freedoms of movement, expression, association and assembly. These threats are presented by both state and non-state actors who are mainly influenced by political decision making processes. Non state actors include armed groups, corporations, and individuals. Yet-human rights defenders are important partners for our government and in the election period, as they are able to provide insight into and information about matters pertaining in different areas of Uganda. According to the Uganda Human Rights Commission 17th Annual report, 2014, HRDs continue to face challenges such as arbitrary arrests, harassments, intimidation, threats, killings, detention, torture, defamation, suspension from their employment, denial of freedom of movement and difficulty in obtaining legal recognition for their association and failure for the state to prosecute those who have violated the rights of HRDS. Similarly the Public Order Management Act (2013 and the Non-Governmental Organizations (NGO) Registration Amendment Act (2006), among others, limit activities of HRDs. These laws have undermined the work of HRDs and the enforcement of these laws by the police has led to cases of abuse, torture and ill treatment, malicious prosecution, emotional and psychological distress on HRDs. Recognition that human rights defenders are key agents of change has been at the top of the agenda of world leaders. For instance world leaders have increasingly committed to promote and create a safe space in which HRDs can work safely, without the threat of arrest or intimidation. The government of Uganda through different laws, organs and policies has made commendable strides in the protection of human rights, and protecting and promoting the work of HRDs will help in reducing human rights abuses in the country. HRDs in different parts of Uganda continue to be vital to the development of democratic processes and institutions, ending impunity, promotion and protection of human rights and highlighted cases of human rights that the government wouldn’t otherwise be aware of. This shows that HRDs can help to ensure long term sustainable development based on human rights. They deserve everyone’s support as well as protection by the government. 1. Ensure that HRDs work in a safe and enabling environment and where violations are committed they are promptly and fairly investigated. 2. Ensure that journalists who cover elections are given access and are not attacked and their equipment protected. 3. Ensure that the safety of HRDs who monitor and observe elections is guaranteed and that they are enabled to reach all locations including polling stations. 4. Enable defenders to monitor and document all violations without any hindrance and that they can access all the necessary information. REGIONAL LEVEL TRAINING ON MONITORING,DOCUMENTING AND REPORTING ON HUMAN RIGHTS VIOLATIONS FOR NATIONAL COALITION OF HUMAN RIGHTS DEFENDERS MEMBERS IN EASTERN UGANDA. 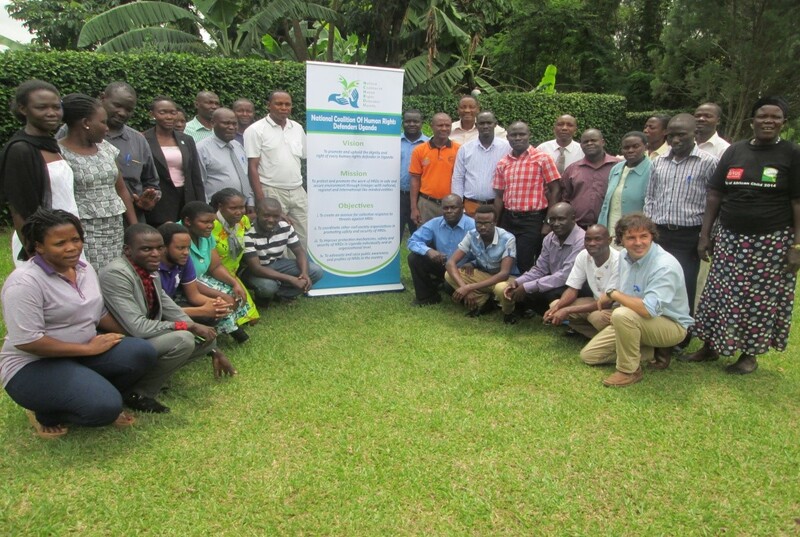 In June 2014, with support of the UN Office of the High Commissioner the National Coalition of Human Rights Defenders Uganda hosted 40 Human rights defenders to an intense three day workshop on Monitoring, Documentation and reporting of human rights violations in Mbale,Eastern Uganda. The Human Rights defenders were drawn from various thematics: Child rights protection, land rights, women rights et al. The participants engaged with the facilitators on engaging Human rights protection mechanisms inclusive of national, regional and International. A documentary around the workings of the Human Rights Council was also shared with participants! HRDs in the region realise that there has been surging rights abuses in mining areas of Karamoja and post disarmament abuses that still need redress. So they found the training useful. The National coalition of human rights Defenders in close collaboration with the office of the UN, organized a two day training for HRDs in the eastern region. The training focused on human rights knowledge and mostly monitoring, documentation and reporting of human rights violations. As most of participants work on reporting Human Rights Violations, it presented them an opportunity to boost their capacity in reporting and documentation. 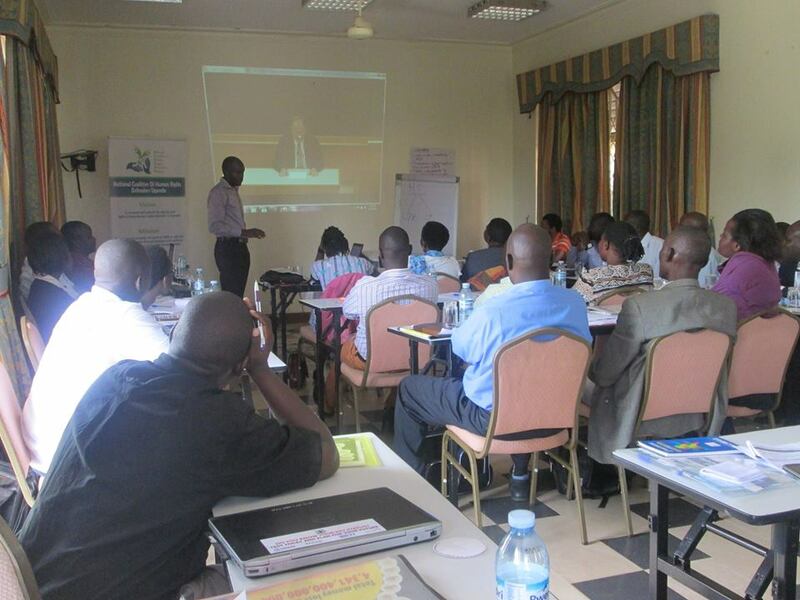 The objectives of the training were to allow appreciation of a common understanding of human rights, appreciation of specific human rights legal frameworks at national ,regional and international level for protection of human rights defenders; it was also to help participants acquire knowledge and skills on human rights monitoring. This initiative feeds in to the greater objectives of the National coalition of human rights defenders which are geared to ensuring an enabling working environment for HRDs in Uganda. Through improved reporting, it would help to raise the coalitions’ advocacy efforts at both National and regional level. Within the National Coalition membership, there are already organizations that do advocacy at both National and international level. With good reports founded on verified statistics, then it would help to realise evidence based advocacy in a bid to address the human rights violations in the region. 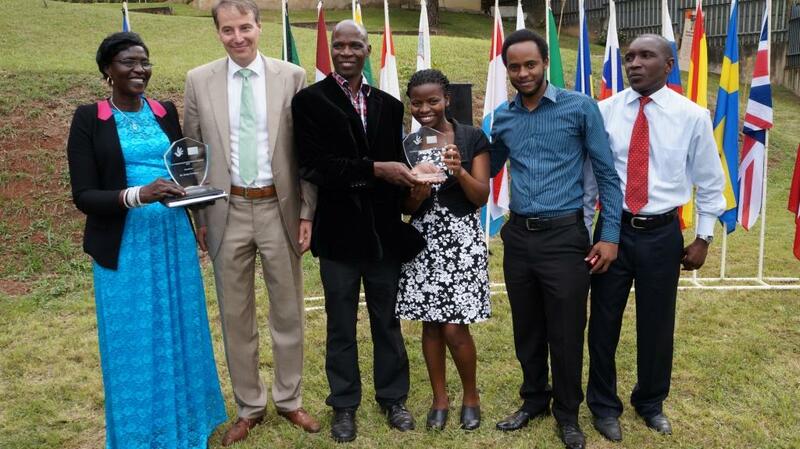 Mr. Ndifuna Mohammed stands out as co-recipient of the coveted 2014 EUROPEAN UNION Annual Human Rights Defenders Award. 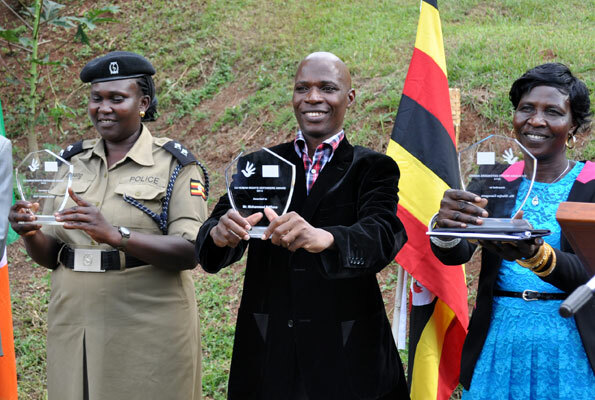 A bright Wednesday afternoon it was on the 4th July,2014 as the annual European Union Human Rights Defenders Award was awarded by EU member states, Norway and the EU delegation in Uganda outstanding human rights defenders in recognition of the achievements of human rights defenders in Uganda. Human rights defenders (HRDs) are individuals that promote and protect universally recognised human rights and fundamental freedoms. These include civil and political rights as well as economic,social and cultural rights. The work of HRDs positively impacts on a country’s development and is essential for encouraging the respect for human rights as recognised by International human rights standards and agreements.HRDs need to be protected from interference and reprisals while executing their work and their rights to freedom of expression, association and assembly need to be safeguarded to enable them to defend others. The heads of Missions of the EU member states, the EU delegation and Norway announced that the 2014 award would be shared between three outstanding individuals which is a departure from the previous two where there was one individual winner. This year’s winners joined Mr. Geofrey Wokulira Ssebagala former National Coordinator of Human Right Network for Journalists (HRNJ) and now Chief Executive officer of Unwanted Witness and Mr. Gerald Kankya of Twerwaneho Listeners Club (TLC) who won the ward respectively in 2013 and 2012. 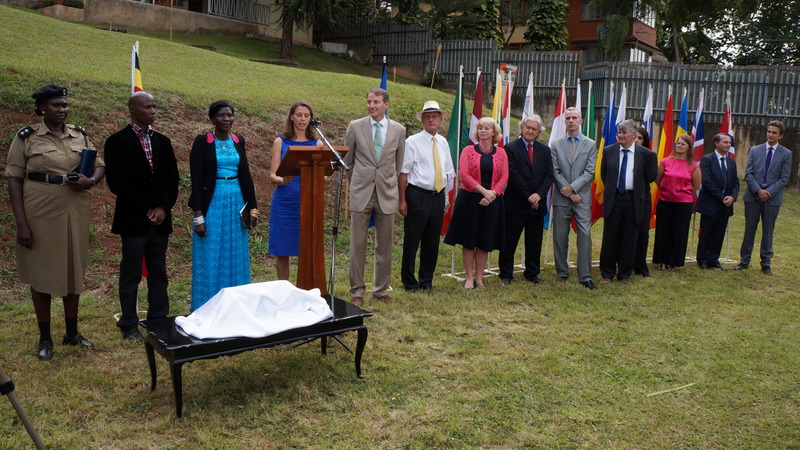 The European Missions in Kampala were thankful to all who participated in the nomination process and expressed their gratitude for the excellent cooperation and the outstanding work of the Ugandan Human Rights Defenders and their organisations. Profiles of the winners in no particular order. Is a tireless supporter of women’s amd girls’ rights in Northern Uganda,especially of those affected by the insurgency. She engages in governance and accountability programmes and fights sexual and gender – based violence. Heads the Family and Child Protection Unit at the police headquarters in Naguru,Kampala. She regularly mediates and provides advice in cases involving domestic violence and child abuse and is committed to protect the rights of society’s most vulnerable. He is the Chief Executive Officer of Human Rights Network Uganda since 2006 and in this position he has contributed immensely to the improvement of human rights adherence in the country focusing on reforms in the Justice, Law and Order sector. He is the Chairperson of the board of the National Coalition of human rights defenders- Uganda that was launched in June 2013 to enhance the protection of human rights defenders in Uganda. He noted that his contribution has come at grave personal safety and security perils but the courage and solidarity from fellow human rights defenders has enabled him to carry. He acknowledged support from family, colleagues at the secretariat and partners. He was thankful to HURINET-U for according him the opportunity and support to do the little that he as been able to do for which he has been recognised. Head of delegation of the European Union delegation Amb. Kristian Schmidt shares a light moment with Ms. Gladys Canogura and Mr. Mohammed Ndifuna the two recepients of the 2014 EU HRD Award flanked by colleagues from Human Rights Network Uganda. Human Rights Defenders continue to face clamp downs by state actors or other perpetrators during the course of their work. This is more prone with Journalists covering sensitive stories, individual HRDs who blow the whistle or bring to the spotlight controversial governance issues. In the recent past, in Uganda we have seen journalists arrested and imprisoned in unknown places. Most recent being the arrest of a Top Radio Journalist on November 26th, 2013 for hosting the deputy mayor of Kampala. He was detained without charge with two other journalists of the same station (http://www.hrnjuganda.org/alerts&stories_full.php?full=102). These trends are worrying and as such an application has been developed to give some level of security to Journalists at the frontlines as we lead up to the 2015 early campaigns. This application is called the Panic Button. As part of the PANIC Button Project, Amnesty International in partnership with the East and Horn of Africa Human Rights Defenders Project and the National Coalition of human rights defenders Uganda is training various individuals/organisations as panic button pilot users. Each of these individuals is availed with a handset to enable them use the application and give feedback in the pilot phase on how applicable and useful it is to them. Importantly how it can be improved to suit their contexts, and this will go on for a pilot phase of 6 months. Today at the National Coalition of Human Rights Defenders Secretariat, we hosted Ms. Halima Athmani a journalist with Ugandan Radio Network for an introductory training in use of the Panic Button. 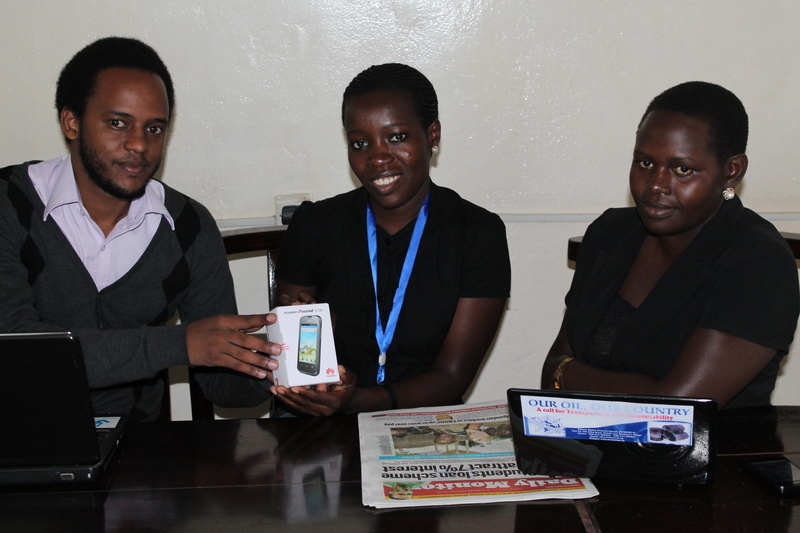 As a team at the secretariat , we ran her through the basics and practical aspects of using the application. We hope this application will go along way to enhance the response accorded to HRDs at most risk. We will be engaging with another batch of HRDs for this pilot phase.